Cam Newton is a large dude and was not particularly thrilled when I met him. I canâ€™t blame him it was early and a team of scientists were about to stick him with needles, then strap him into various pieces of equipment where he would either have to be very still or exert as much energy as possible in a barrage of stress tests. This said seeing a world class athlete in his prime pushing himself to his physical edge in the name of science is a pretty impressive thing to behold, so I forgive him for not being Mr. Personality, and all told I would have been way grumpier than he was. This was not my typical assignment as we were not allowed to disturb the scientists, coach the talent, or light anything. Not even on board flash (which I never use anyway, because it looks like on board flash). Pure reportage photo journalism in a bleak, windowless, badly fluorescent lit room, which usually lends itself more favorably to black and whites in my opinion. Just back to basics and use a fast lens. I shot most of this assignment on the Canon 1Ds Mark III with the Canon 50mm 1.0, 35mm 1.4, and the 24mm 1.4 allowing me to shoot in low light and crush the depth of field. It was tight and not the most ideal shooting condition, but I am spoiled and used to setting things up my way, so it was also a welcome return to reportage. 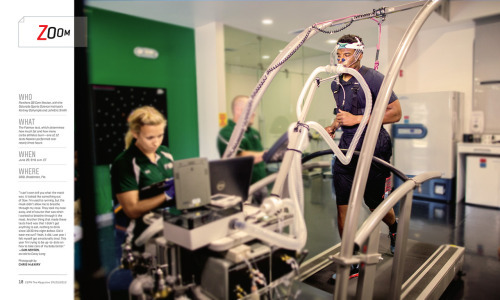 They spent about 3 hours torturing the Panther QB in various ways, starting with blood work and body scans, moving to reaction testing (which he enjoyed the most), then 30 minutes of the fastest running on a treadmill I have ever seen with a full on snorkel in his mouth, then strength testing, and the grand finale speed bursts on the bike that I could barely turn the wheels on. Fun! Gatorade brings in all of itâ€™s top athletes and runs these tests on them and uses the data to plan on overthrowing the world by cloning them. No I kid. I have no idea what they do with the data exactly, but itâ€™s cool to see that they have created a place to record this information on all of these top tier athletes and hopefully they cure cancer with the info or maybe figure out how long it takes athletes to recover from injuries, etcâ€¦.. Cool assignment and thanks to Nick Galac and the photo department at ESPN for sending me on this mission. Thanks to the good folks at Gatorade as well.